Is it too soon to be grilling? I know it’s only april but I LOVE grilling year round. During the winter, I usually grill indoor on my stove top grill because grilling meat is so easy and healthy too. 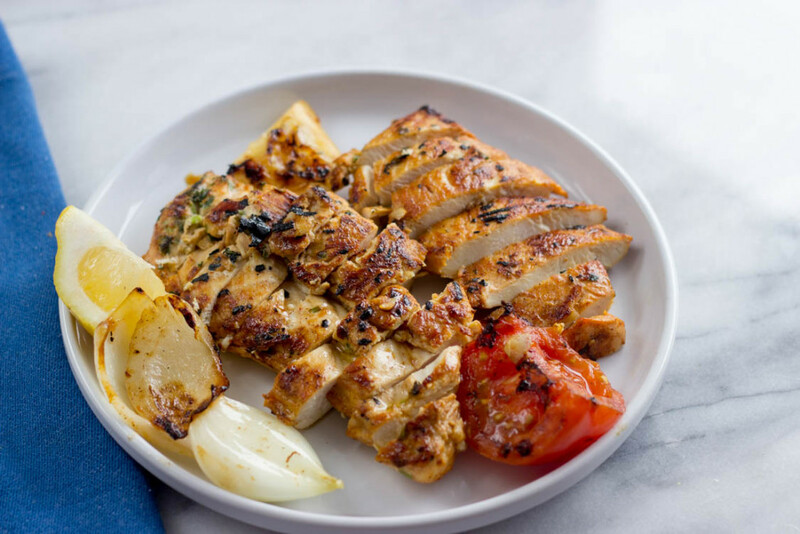 This is my family’s go to grilled chicken breast recipe. 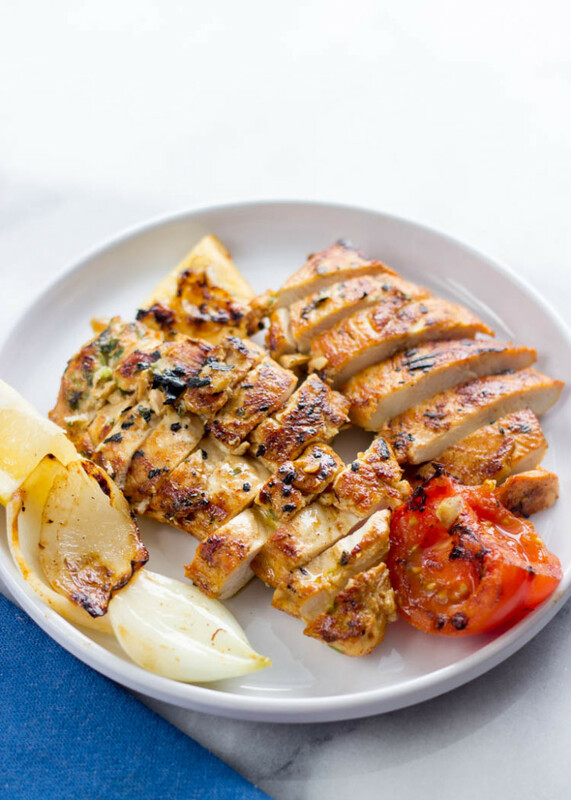 Sometimes we dice up the chicken and make it into chicken kababs or cook the chicken in a pan and use the chicken in all different types of dishes. I used these chicken breasts to make mediterranean inspired chicken rice bowls, which I will be posting in the next few days. Combine lemon juice, olive oil, parsley, garlic, paprika, and oregano in large plastic food storage bag. Pierce chicken with fork several times and sprinkle with salt and pepper. Add to bag and coat with dressing, marinate 20 minutes or up to two days in the fridge. Remove chicken from bag. Grill or broil for about 5-6 minutes per side. Or, cook in a grill pan over medium-high heat, 5 to 6 minutes per side, or until cooked through. WHat a wonderful recipe. Chicken was moist & flavorful. Making this again for company with Rice Pilaf. Thank you! I made this for my wife and I for dinner and she immediately told me that I had to save this recipe. It is very simple yet flavorful. I didn’t marinade for more than 2 hours, but more time would probably have made the chicken even better. Thank you for posting this recipe! My husband and I love this recipe! so easy and super juicy! 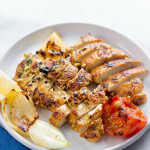 best grilled chicken recipe ever! Can i use dried parsley instead? Hie much? Thanks! Yes, you can substitute dry parsley. I would use one teaspoon dry parsley. Just had this for dinner and everyone thought it was Fantastic! This was GREAT! It’s going into my top 20! I cut the breasts in half and took off the tenders. I still felt the interior needed to be a little more cooked. I think the improved moisture increases the cooking time. I put four big chicken breasts in the marinade for about 5 hours. Then I grilled them with red peppers and zucchini. It took longer than directed, and I had to cut them up into smaller pieces. They were good, but I think they should be complimented with a yogurt sauce. They went well with my tabouleh salad. Next time I would cut them into smaller pieces before I put them in the marinade, and make tzasiki sauce to put on top or put it in a salad. You are very welcome! Thanks for leaving a review! Wow! rate for recipe i give 5 star!! This looks like a great seasoning for grilled chicken. I will try it!